St. Paul, Minnesota (CNN) -- When Max Adrien first heard that a massive earthquake had leveled Port-au-Prince, Haiti, it hit close to home. His brother lives in Haiti, and thankfully survived the January 12 disaster unharmed. Adrien's first instinct was to help his home country. "I said to myself, 'I need to go to Haiti.'" After speaking to his brother, he realized that he would need a skill that was in immediate demand. Otherwise he would just be in the way of other relief efforts. So he came up with a unique idea. "I decided to give Haiti what I have, which is teaching," said Adrien, who is a French professor at Hamline University in St. Paul, Minnesota. "I don't think I can give Haiti a better gift." 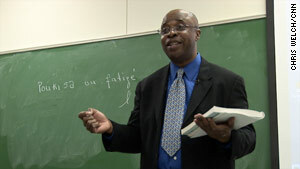 Max Adrien, a French professor from Haiti, offers a free Creole class. And that's how his Haitian Creole class was born. "I'm just giving something that has been given to me," Adrien said, referring to his native language. His class isn't made up of the typical credit-craving college co-ed. That's mainly because the vast majority of students have long since finished college. The class is free of charge and open to everyone. The roster of students includes local doctors, nurses, physical therapists, social workers, lawyers and ministers. All of them have either been to Haiti or are planning volunteer trips soon. Rick Treece, whose wife is a physician (not pictured), plans to volunteer in Haiti. "They appreciate when you try," said Donna Richtsmeier, a retired nurse who travels to Haiti to volunteer. "I just want to learn a few phrases so I can greet them and ask how they are." Retired educator Ruth Anne Olson has been to Haiti three times in the past four years. She has been working on a collection of personal stories of people living in Haiti. She says knowing more Creole will make conducting her interviews easier. "I needed to learn something about the language because particularly I found that I couldn't have any conversations with women," Olson said. "The women either do not speak English or they're more shy about trying it." She said it was hard finding someone who spoke the language in Minneapolis, Minnesota, let alone providing a free class. Adrien began teaching in February, and now helps students for one hour every Tuesday. He has about three dozen students. 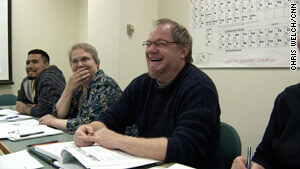 "It is so gratifying...to see that there are people out there who want to help," he said. "Angels are in the form of people." Adrien has lived in the United States since he was 20, but he says his heart remains in his home country. "Haitians, in a way, capture the essence of the human spirit," Adrien said, sharing his love for, as he puts it, "my people." 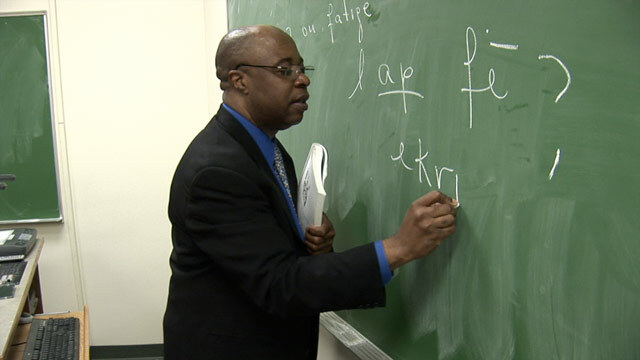 Even if his students only learn a few simple phrases in Creole, Adrien says it will have a profound impact. "If they see an American say 'How are you today, how are you feeling, what hurts?'... I know the smile that would put on somebody," he said. "The appreciation they would get to see an American not only care enough to be there but care enough to learn the language to speak to me in my own tongue and make me understand that I matter ... I know the joy that would bring to a Haitian's heart," he said. "I don't think you could give Haitians a better gift."